According to the KMG Rides Facebook page, a 2nd KMG speed is under construction for Goldenway Amusements named "Speed 2"
Why not shop around for something new & original?,we already have two of these,or are they selling their original and replacing it with a new model?. They are getting two models so they can do more shows...there is the demand for these sort of rides. For example they could do Melbourne with one, and Perth with the other. IMO it's not a bad business move and with Chants Freestyle not doing many shows in QLD any more its a perfect idea to be able to do double the shows now. 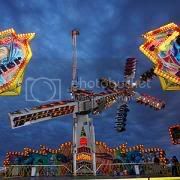 Hurricane wrote: They are getting two models so they can do more shows...there is the demand for these sort of rides. For example they could do Melbourne with one, and Perth with the other. IMO it's not a bad business move and with Chants Freestyle not doing many shows in QLD any more its a perfect idea to be able to do double the shows now. Would seem a bit odd if they were sending it back calling it "Speed 2"
That's just my opinion really. I almost feel like it would have been better just naming it "Speed" even if they are 2 units that appear to look much the same. I am really undecided on weather I like the look of this unit over the original one. IMO the original one looks much cleaner and simplistic and at night looks great. I really do wish they did something a bit more with the lower panelling though as it's very plain. If they decide to set up at Mardi Gras it'll fit right in.